Oli Webb, who won three times on the way to third in his debut season in British F3 last year, has signed to compete in Formula Renault 3.5 next year. The 19-year-old from Manchester will join Spanish squad Pons Racing, the creation of former motorcycle road racing champion Sito Pons. 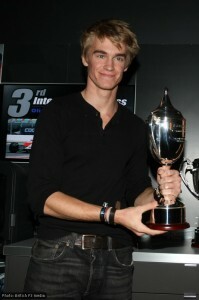 Webb said: “I’m very excited about the opportunity to race with Pons Racing in the World Series by Renault. “The calendar and grid is strong and it will therefore be a tough year, but after a visit to the workshop in Barcelona I have no doubts we will be fighting as a main contender. Sito Pons said he was delighted to have Webb on the team: “Oliver is highly promising young talent who achieved excellent results in his rookie year in the competitive British F3 championship. “He has made the right move to the World Series by Renault and we are convinced that he will waste little time in adapting to the characteristics of the new car and championship. Pons Racing finished eighth of 12 in the FR3.5 team championship last year, but counts a dozen victories in its history and won the 2004 World Series by Nissan title with Heikki Kovalainen. Categorised under WSR, tagged under Oli Webb, Pons Racing.